Check out our current Epson promotions to see how you can make more margin & profit on your sales. Epson Essentials offers great monthly print savings across our range of printers, or you can browse by the product range that best suit your customers’ needs to see the applicable promotions. 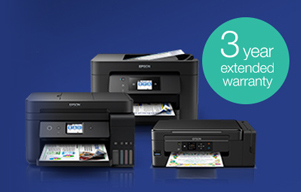 Customers can relax and enjoy extra piece of mind by registering their Epson printer for a 3 year* extended warranty, free of charge. Customers can claim FREE 5 year extended warranty with WorkForce scanners purchased between 1st April 2018 and 31st March 20191. Fast, versatile and reliable, Epson’s WorkForce scanners are tailored solutions that meet your needs whether you capture, convert and distribute information to almost any document management system. 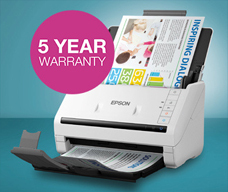 Epson provides standard one year warranty with all models, but is now extending this to five years on selected models for worry-free scanning.